DR. Z orig. 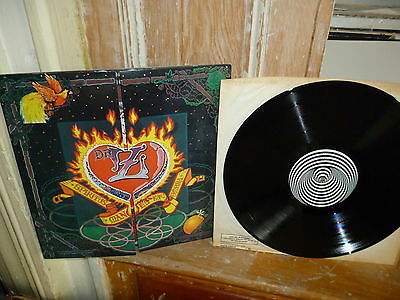 THREE PARTS TO MY SOUL lp AMAZING SUPER RARE U.K. PSYCH! I currently DO NOT ACCEPT bids/ship to GERMANY, ITALY, RUSSIA and all of SOUTH AMERICA. SORRY! International bidders should consider that tracking and insurance are at the buyer's expense. I make a concerted effort to grade conservatively and my feedback reflects this. PAYMENT IS EXPECTED IN 3 DAYS. If you need a bit more time, please contact me before placing your bid. If you have any problems whatsoever with a transaction please contact me before leaving feedback and I'll do my best to make things right. Please wait for my invoice before sending a payment! DO NOT USE EBAY CHECKOUT!I WILL SEND AN INVOICE WITHIN A 24 HOUR PERIOD OF THE AUCTION’S END. I ship 33’s and 45’s in new LP mailers between 2 cardboard fillers. Vinyl and inner sleeve are are always removed from jacket and are always put in protective plastic sleeve to protect jacket from splits in preparation to ship. Buyers with less than 20 feedbacks should contact me before bidding for approval or your bid may be cancelled! If you there is any confusion or you have questions with items I have for sale, questions about my shipping rules or questions in general be sure to contact/clear them with me prior to bidding. For any return or refund, item must be returned in same condition as listed in my auction (i.e. if the record is described as "sealed" or "mint" it should not be opened or in lesser condition than described in my listing when shipped back). **INTERNATIONAL BIDDERS & DOMESTIC BIDDERS PLEASE NOTE ** DUE TO THE RARITY OF THIS LP I WILL DEFINITELY BE SHIPPING IT EXTRA SECURELY (WITH TRACKING & INSURANCE! THE COST TO SHIP THIS TO MOST COUNTRIES OUTSIDE THE U.S. WILL BE AT LEAST $50. DOMESTIC SHIPPING COULD BE CLOSE TO $20 WITH INSURANCE. IF YOU CHOOSE TO BID, PLEASE UNDERSTAND THESE TERMS! Up for grabs is an absolutely amazing and mindblowingly rare (probably one of the rarist of rare Briish psych records of all time) ORIGINAL U.K. pressing of a monster psych rarity! This is an original U.K. pressing of an lp by DR. Z entitled THREE PARTS OF MY SOUL (VERTIGO 6360 048, 1971 - HAS CORRECT 1ST PRESS MATRIX ON BOTH SIDES OF DEAD WAX6360 048, 1Y//1, 2Y//1). ORIGINAL U.K. DIE-CUT JACKET (TWO FLAPS OPEN UP LIKE A DOOR ON FRONT OF JACKET) IS IN VG+ TO VG++ CONDITION; MINOR CORNER DINGS/FRAYING, SPINE WEAR, SCUFFS & FAINT RINGWEAR FRONT/BACK OF JACKET. AN ABSOLUTELY GREAT COPY CONSIDERING IT'S AGE & SCARCITY! VINYL IS IN VG++/EXCELLENT CONDITION; BARELY PLAYED AT ALL! VINYL IS SUPER CLEAN/SHINY! NO VISIBLE MARKS, SCUFFS OR SCRATCHES. LOOKS/PLAYS SUPERBLY WITH SOME FAINT SURFACE NOISE & A FEW FAINT POPS (NOTICIABLE IN QUIETER PARTS OF THE LP). A BETTER COPY YOU AREN'T LIKELY TO FIND ANYTIME SOON! THERE IS A "MADE IN GREAT BRITAIN" STAMP ON THE SIDE 2 LABEL (SEE PHOTOS). PLEASE BE SURE TO CHECK MY OTHER MONSTER RARE LP'S GOING UP NOW & IN THE NEAR FUTURE!